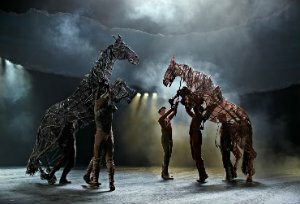 War Horse tells the powerful and uplifting story of young Albert, his beloved horse Joey, and the unimaginable obstacles they overcome both individually and together. At the heart of the show are life-sized puppets which bring breathing, galloping, charging horses to thrilling life on stage. Filled with stirring music and some of the most innovative stagecraft of our time, WAR HORSE is a remarkable tale of courage, loyalty and friendship, and an unforgettable theatrical experience.